Since I have had a few weeks off from classes at Faulkner University, I was able to dig into some pleasure reading. In particular, I was able to dig into some Lord of the Rings commentary I have been meaning to read that I hadn’t gotten around to. Consequently, this week you get three book reviews before I dive into this next semester. In the first book we’re going to talk about together is Frodo’s Journey: Discovering the Hidden Meaning of The Lord of the Rings by Joseph Pearce. It was published by St. Benedict’s Press in 2015. Pearce begins his work by establishing, as Tolkien himself said, that The Lord of the Rings is absolutely not an allegory by is a fundamentally Catholic work. Pearce uses this understanding to establish his thesis that this book allows the reader to see himself in a mirror, but it can also transform the reader into what he actually can and should be. The Ring itself is explained by Pearce as synonymous with Original Sin. This is a claim that I don’t know is entirely justifiable and causes problems since it is so foundational to his ongoing argumentation. It is certainly not the source of all evil in Middle Earth, and evil still exists after it is utterly destroyed. Yes, the Ring is destroyed on the traditional date of Good Friday, March 25, so there is certainly the potential to draw that correlation, but the defeat of sin and the breaking of its power on Calvary seems to have much more widespread implications for humanity than the demolition of the Ring has on Middle Earth. A great evil is destroyed, but not the great evil that Jesus destroyed. 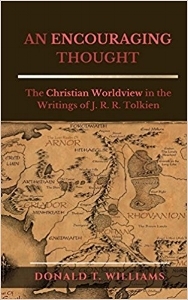 With that potential issue aside, Pearce highlights the emphasis that Tolkien puts on Providence, suggests that Tom Bombadil can be representative of the pre-fall Adam among many other interesting topics that highlight the relationship between the trilogy and specifically Catholic theology, although most of his observations apply to Protestantism as well. The strength of this book is undoubtedly that I believe Pearce delivers on his promise. He promises that the reader is going to see himself in a mirror, and through the portraits that are highlighted by the author, we see the potential for what can and perhaps should be. We might not resist evil, but we can aspire to resist the power of evil as Faramir did. I could relate to that hopeful vision. I have felt it as well. The biggest suggestion for improvement I would have made is that the title promises we will find a hidden meaning. There are several meanings in this book, but it seems that the greater purpose of the book is to help demonstrate a better way for humanity as I pointed out above. It gives us hope, and it shows us what we can be. Perhaps there are some connections that Pearce makes such as the emphasis on March 25 that may be kind of hidden meanings, but I don’t know that the entire purpose of the book was to find a hidden meaning. It helps us relate to the book on the deeper level, but that is fundamentally different than the hidden meaning I would expect based on the title. Overall, this is a good read. It is definitely worth your while particularly if you want to think more about The Lord of the Rings. I did find that it had a few problems that could have been strengthened in my opinion, but I would still recommend picking this one up.